At outbreak of war, Serjeant T. Rowlandson, a Territorial soldier aged 32, immediately volunteered to serve King and country. He was transferred from the Durham Light Infantry territorials to the Royal Engineers Signals (R.E.) His new regimental number was 1801 which was later re-numbered to 463163. Sjt. T. Rowlandson entered France 8 April 1915 when 33 years old. He survived the war. This is his story through his eyes as told by his diary. I have been faithful to the text, with the odd correction. In this section there are additional notes and photographs included below which provide a brief summary of the 50th (Northumbrian) Division in order to give diary some context. This will be periodically updated. A brief commentary of events is provided to give further explanation. The Northumbrian Division had been allotted the Steenvoorde area west Ypres, Belgium (Belgian Flanders) in which to concentrate and train. 22 April: the last units arrived. The men would have expected a short period of training behind the line. That was not to be. At 10.40pm, news came in of a German attack near Langemarck/Bixschoote. 10 minutes later an order was received to have 6 companies of the York & Durham Infantry Brigade fully equipped, ready to move by motor-bus. At 11.29pm, another order came requiring all units to stand by billets, fully equipped and ready to turn out immediately. 22 April: at about 5pm, the first use of gas by the Germans on the Western Front hence the order to have the Northumbrian Division standing to. After the war, the Canadians erected the Brooding Soldier Memorial in honour of those troops who were killed (see Photo Gallery). 23 April: The York & Durham Infantry Brigade arrived at Camp A between Vlamertinghe and Ypres in the afternoon. The Northumbrian Division did not take part in any fighting. 24 April: the enemy’s guns opened fire and for the first time the York & Durham Brigade was shelled, wounding several men and the Northumbrian Division suffered its first casualties of the war. The 4th Yorkshire Regiment (the Green Howards) and 1/4th East Yorkshires were detailed to move up to the line near Potijze Chateau. The Germans occupied St. Julien by 3pm and were moving out of the village southwards when they were attacked by the 4/GH and 4/EY. The 50th (Northumbrian) Division Memorial is erected at St. Julien in memory of this gallant attack (see Photo Gallery). 5/GH and 1/5th DLI moved forward from the Yser Canal to St. Jean to support the 3rd Canadian Brigade and both came under shell and rifle fire. 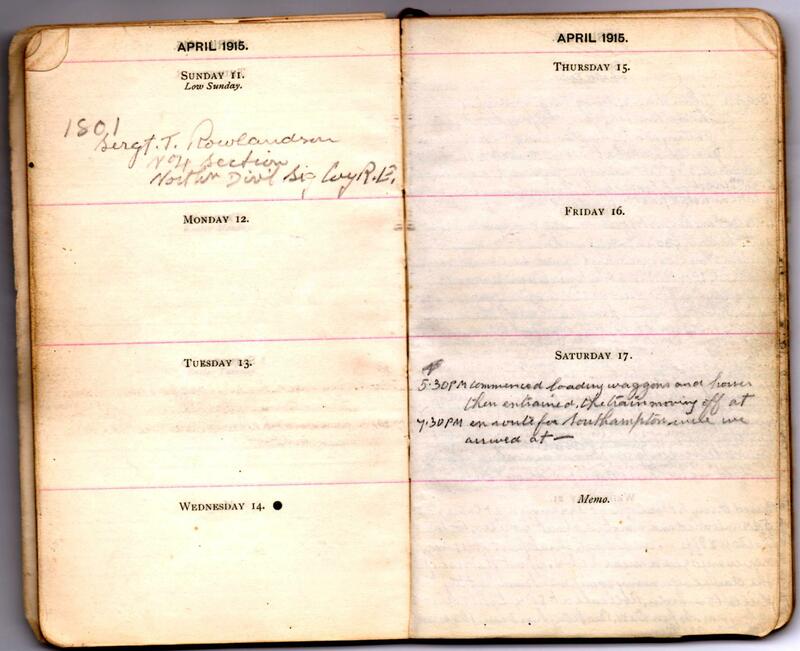 The night of 24/25 April was miserable with constant rain and heavy German shell fire. The Northumberland Infantry Brigade and Durham Light Infantry Brigade were at Brandhoek and Vlamertinghe respectively and did not move until late in the day. The Northumberland Brigade got to Weieltje by 4.30am, 25 April. The DLI Brigade received a succession of orders, one countermanding the other but eventually 1/6th DLI moved to beyond Ypres and relieved 7th & 9th Shropshires in the line and 7th & 9th DLI bivouacked in Potijze Chateau grounds under shell fire. 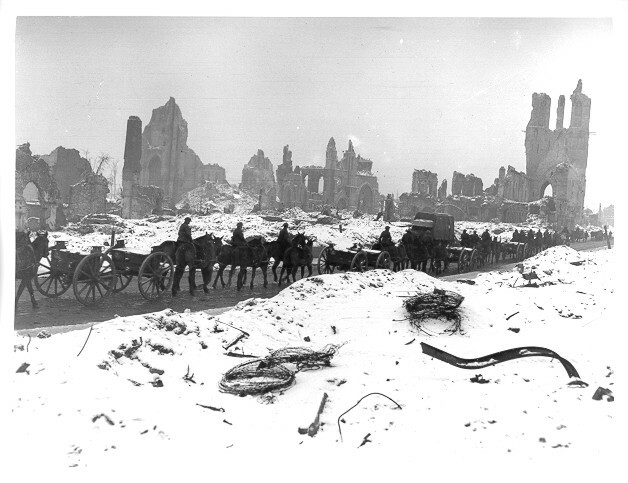 8th DLI marched to Zonnebeke via Vlamertinghe, Ypres, Potijze and Verlorenhoek frequently being shelled. Then they were ordered to relieve the 8th Canadians at Boetleer Farm. They arrived there at 3am (25th). The situation evidently was chaotic. The strength of the Division on land in France was 572 officers and 16,858 other ranks. 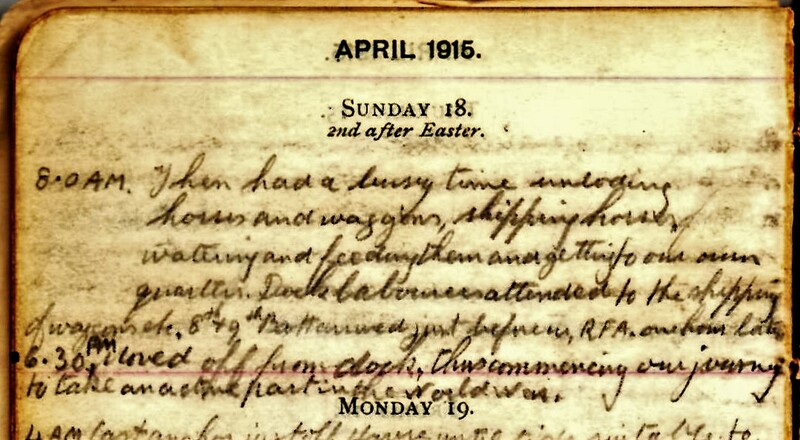 1 May 1915: Tom’s Diary records the death of his friend Serjeant T. Venn, 6/DLI and elsewhere there is a page listing a number of casualties. 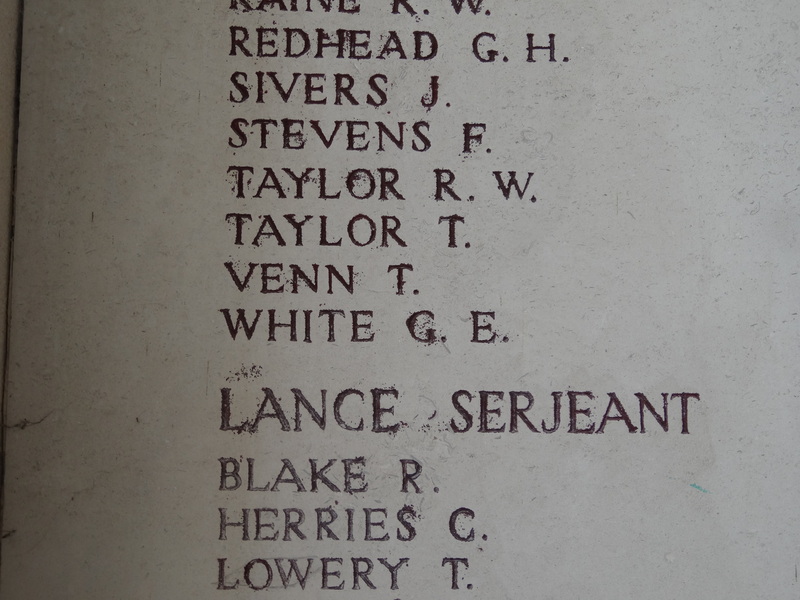 308 Serjeant Thomas Venn, 1/6 DLI was killed in action 26 April 1915, has no known grave and is commemorated on the Ypres (Menin Gate) Memorial. He served in the Territorial Force since 1 April 1908 and was promoted to Serjeant 29 June 1914. Sjt. Venn was embodied for service 5 August 1914 and entered France 19 April 1915. Thomas Venn was 40 years old, married to Ellen. They had 8 children and lived at 24 Catherine Street, Willington. 1817 Sapper W.G. Armstrong, 50th (Northumbrian) Signal Company, Royal Engineers was killed in action 25 April 1915 and is buried in Ypres Town Cemetery Extension. He entered France 19 April 1915. He was 21 years old, unmarried, the son of Mrs. E. Armstrong 6 Cross Street, Oakenshaw, Willington. 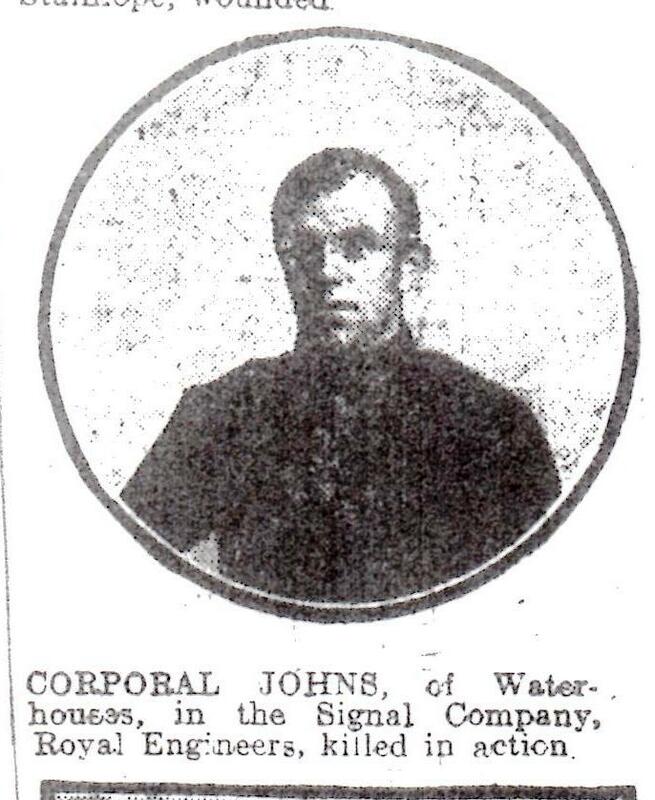 1804 Second Corporal William Johns, 50th (Northumbrian) Signal Company, Royal Engineers was killed in action 26 April 1915 and is buried in Ypres Town Cemetery Extension. He formerly served with the DLI (regimental number 345) entered France 17 April 1915. 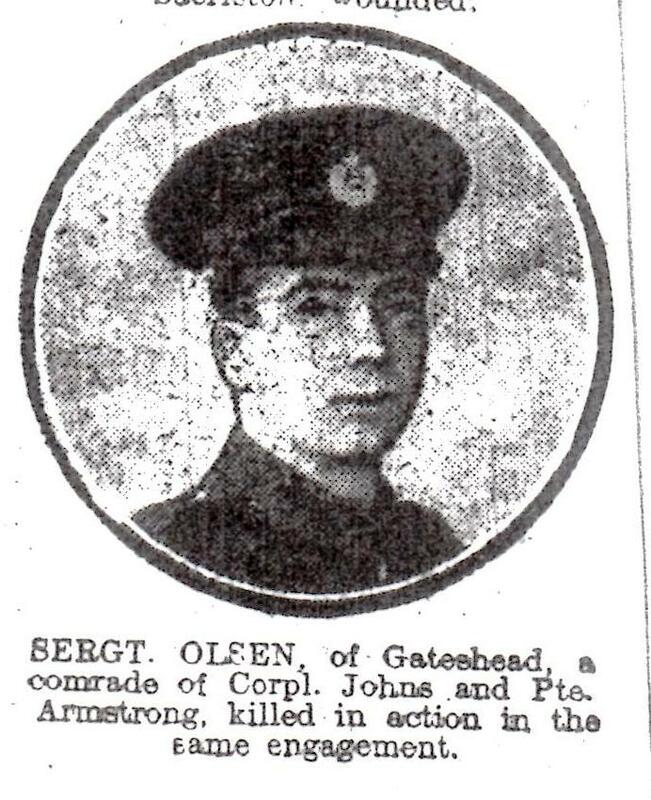 1802 Serjeant Harry Olsen, 50th (Northumbrian) Signal Company, Royal Engineers was killed in action 26 April 1915 and is buried in Ypres Town Cemetery Extension. He formerly served with the DLI (regimental number 62) entered France 17 April 1915. There is also another young man who Tom must have known. He was 18 year old Private Walter Garbutt. 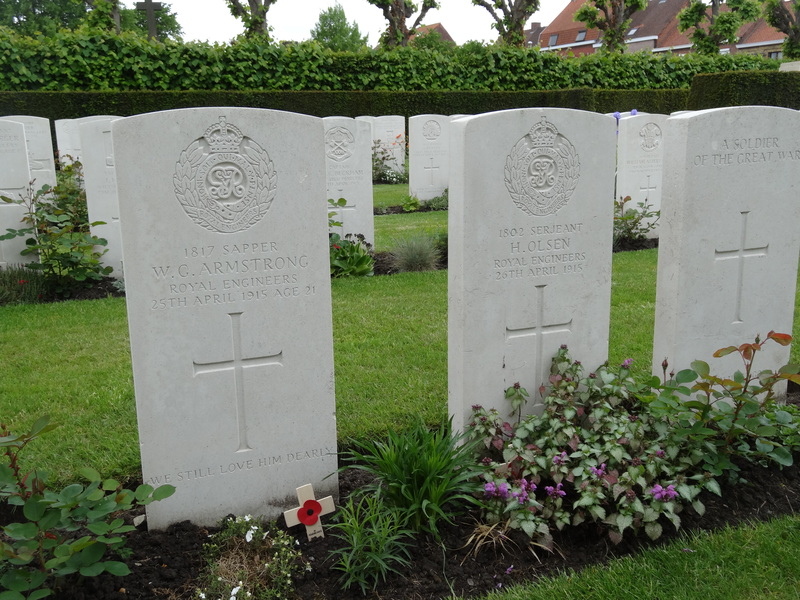 1611 Private Walter Garbutt, “C” Coy., 1/9 DLI was killed in action 25 April 1915, has no known grave and is commemorated on the Ypres (Menin Gate) Memorial. He was 18 years old, unmarried, the son of John and Rosena Garbutt, 47 Richmond Street, Gateshead. The next engagements soon followed. The Division occupied trenches to the south east of Ypres around Sanctuary Wood and Hooge for the remainder of the month and into June. It was called into action again. It was estimated that 50th Division lost 90 all ranks during the course of this action. The 50th Division was to take over the line opposite Messines and Wytschaete. The 150th Brigade moved to Dranoutre and went into the line during the night of 21/22 June and by 24 June the Division had taken over the new sector. Compared to the Ypres Salient this was a relatively quiet sector. The 6th Division including 2/DLI was engaged in re-capturing Hooge which had been lost in July. The 50th Division knew this area well and the tremendous bombardment was heard “up north”. The French and British Armies launched a major offensive intending to break through enemy lines and strike a decisive blow against the Germans. 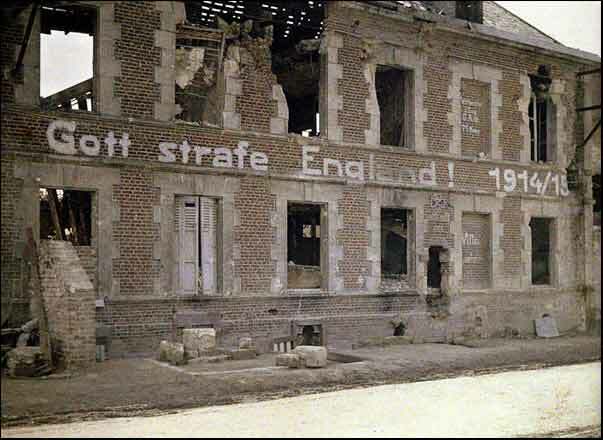 French forces attacked in Champagn and Artois. The British attacked along a 10 km. front between Loos and La Bassee with 75,000 men involved on the 1st day alone – “the Big Push”. The casualties on 25 September were the worst yet suffered in a single day by the British Army, including some 8,500 dead. In total, the battle resulted in 50,000 casualties of whom some 16,000 lost their lives. Please refer to these soldiers for more details of this battle. Although not involved, the 50th Division were given orders to make demonstrations of “pretend attacks” – artillery, rifle and machine gun fire and setting fire to straw and phosphorous bombs out in front of the trenches in order to deceive the enemy into thinking that a gas attack was imminent. August, September, October and early November was spent in this sector. It came to an end 12 November 1915. Every battalion went into the front line and served several days in varying degrees of comfort and discomfort, suffered casualties which were relatively few compared with totals later then handed over the line to troops and went to Armentieres for a short rest. 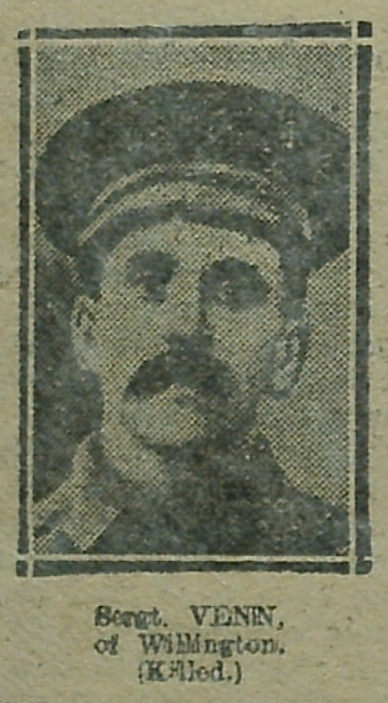 a serjeant of the 5th Battalion, the Loyal North Lancashire Regiment who drowned in a canal. He was 2042 Serjeant J. Grist, 1/5th Battalion (Territorial Force) Loyal North Lancashire Regiment who died 7 November 1915. 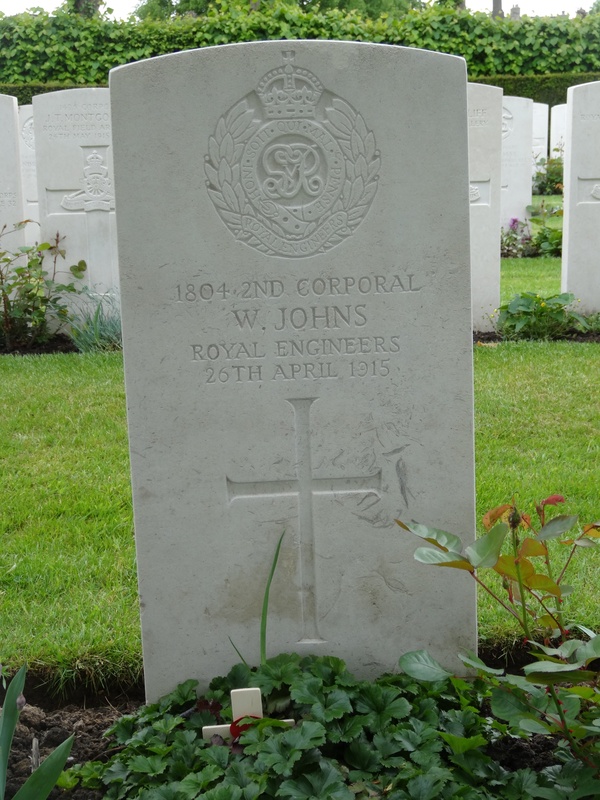 He is buried at Houplines Communal Cemetery Extension, Belgium. Tom’s cousin, 7267 Private S. Rowlandson, 11th Battalion, the Lancashire Fusiliers who was killed in action 16 November 1915 and is buried at Gunners Farm Military Cemetery, Hainaut, Belgium. 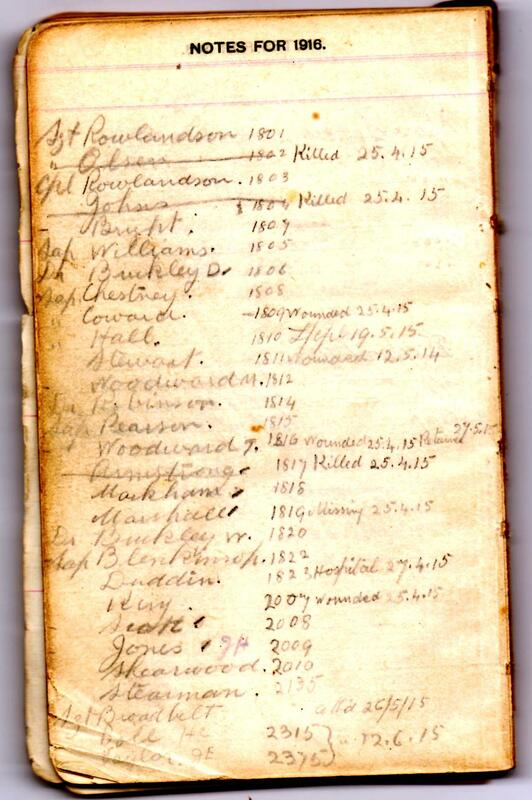 607 Officers and 11,948 Other Ranks.